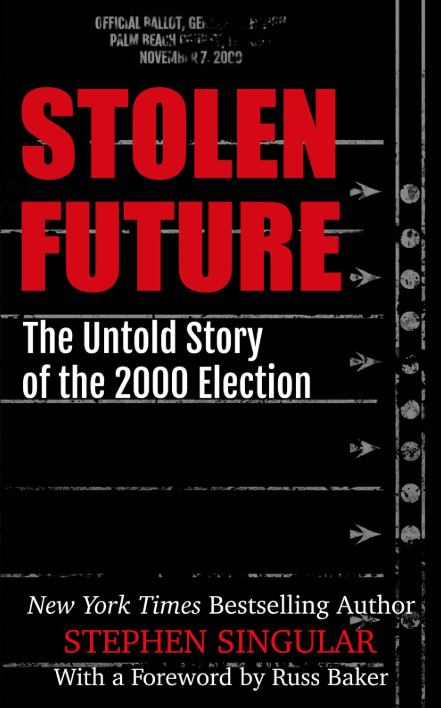 In Stolen Future, investigative reporter Stephen Singular conducts a breathtaking historical excavation of a still-controversial “cold case”: the disputed, nail-biter 2000 election in Florida. Remember the infamous “hanging chads?” The outcome of the election was, amid uproar and rancor, ultimately decided by the Supreme Court. But what really caused those thousands of votes to be invalidated? Determined to find out, Singular dug deep — and uncovered shocking secrets about the extent to which our trusted election mechanisms can be compromised. But his story was never told. Instead, it was suppressed, ignored, and then buried. Until now, that is — just in time to be a part of current heated discussion regarding US election fraud. Time and again over the years we have seen proof that our machinery for choosing leaders is shamefully vulnerable to manipulation and chicanery. Since the 2000 debacle, standards have actually declined, as electoral authorities across the country abandoned not just punch cards but also reliable and re-countable hand-marked paper ballots — in favor of the false promises of technology. They have bet our democracy and our future on totally opaque black-box electronic devices that can be “hacked” by both outsiders and insiders. This is an issue that should keep you up at night. And after reading Stolen Future, a real-life thriller, you will never take the security of your vote for granted again. Available Now at Amazon, Barnes & Noble, Apple, Kobo, Scribd, Playster… and more!